Last week I gave a presentation on the Elston family. It was a story of a family and of a town – our town of Crawfordsville. The Elstons had a huge influence on Crawfordsville and on the state of Indiana. The homeplace of the Elstons now serves as the home of the Wabash College president and has become a part of our college’s history. As the first brick house built in Crawfordsville, it was the home of one of the richest men in Indiana. The furnishings, draperies and rugs were imported from back east and New Orleans. It was evidently a sight to see – the young Lew Wallace crept up to the windows to see what a piano was and how it worked. The house is now a lovely old home on East Pike Street with all of the modern amenities. When one enters the front door they gaze down the hall under the stairway. Here’s the thing though, we now enter the house from what was originally the back door. 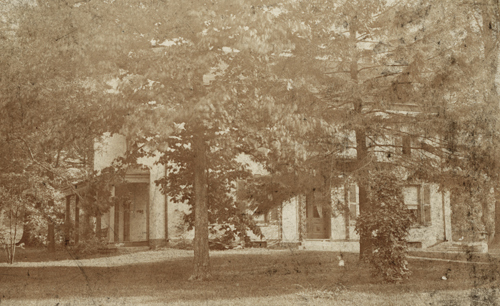 The photo above, taken in 1880 shows the home as it was originally. Atop a slight rise with a long walk from Main Street to its double doors. When a visitor in the 1800’s entered the Major’s home, the view was of the lovely staircase rising to the second floor. In 1910 two lots north of the homestead were sold and two houses were built on Main Street. Lovely old homes – twins except for their exteriors – one of stone and one of yellow brick – they feel today like they have always been there. 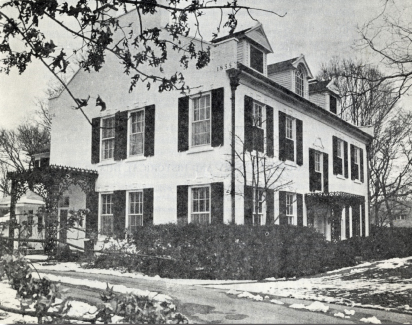 When this sale of lots occurred, the entrance to the home was switched from the north side of the home to the south side, or the current orientation. One thing I have always wondered about the Elston Homestead is the current wrought iron front porch. Was that added later or was it original to the house? 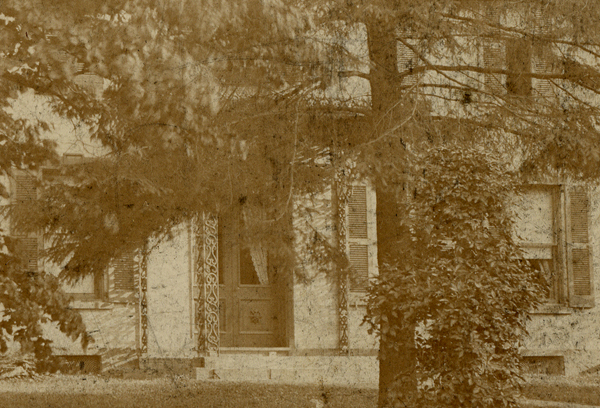 With this photo scanned and enlarged, I can see that in 1880 the entry had a wrought iron porch. Looking at an image of the porch of today, this looks like either the same structure moved to this façade or a very good recreation of the original. 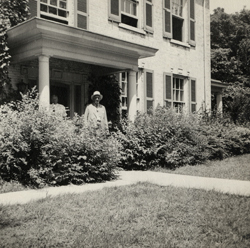 We do know that the south side of the house had a different porch at one time as we can see in this photograph of Ike Elston coming out of the door on the south side. Whose bell is it anyway? What a rich set of traditions surround this game! 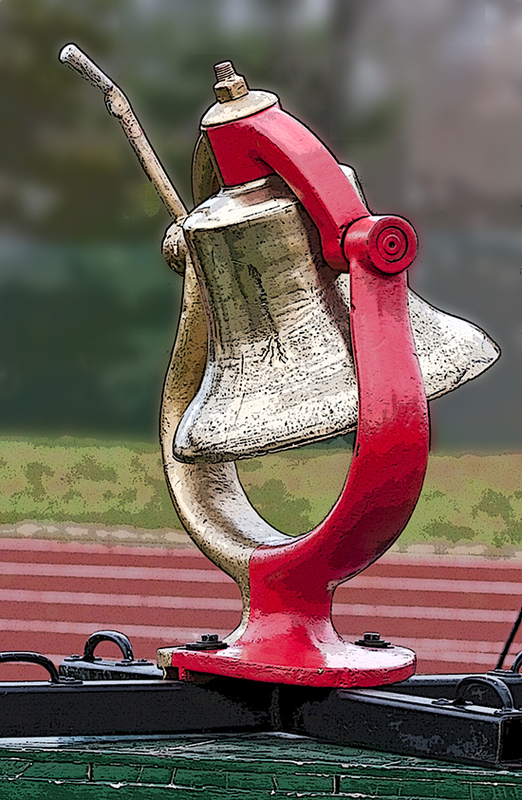 The rivalry goes back a long way and the Battle for Bell is a part of every Wabash man’s history since 1932. We are always proud to display the bell and like to think of it as ours…this is just as it should be since the bell was given to the rivalry in 1932,our centennial year! It seems a fitting 100th birthday present. So here is a funny story about the bell and the archivists of Wabash and DePauw…Wes Wilson, the archivist at DePauw is just a great fellow who is universally respected for his archival knowledge and superior management skills – the Archives at DePauw are just a wonderful resource! No surprise to me then when I saw that Wes was to speak at the national convention of the Society of American Archivists a couple of years ago as he is that prominent in the field. I entered the room along with about 30+ other archivists and prepared to listen to Wes as he spoke about accessioning – the process in which an artifact or collection becomes a part of the archives. Really a great presentation on the nuts and bolts. Things were going along swimmingly until Wes showed a slide of an accession, complete with number, of the MONON BELL!!! Now hold on a minute I thought – you can’t accession that bell – you don’t own it and only have it on your campus from time to time! Being polite, as I am, I thought it best to wait until the end of his presentation – but then I pounced! Wes, with his typical friendly smile saw me approach and, of course, knew what was to come next. He offered that of all the archivists in the world to pop into his presentation – there was only one who might object at his use of visual aids – me! Wes explained that he had simply used the bell as a demonstration item and we declared no harm, no foul in this instance and laughed heartily over the affair. So a salute to Wes and his good work at DePauw BUT let’s just make sure that the bell returns to Crawfordsville where we can keep a close eye on it!! One of the notable characteristics of our Archives here at Wabash is their lack of summary history. In other words, all too often we find information scattered through several files. During the course of his retirement from the chemistry faculty, Dr. David Phillips has been doing a fair bit of research here in the Archives. He has researched a variety of topics and provided us with his excellent summaries. What I love about David’s work is that it is always expertly researched and succinctly presented. David has been working for the past several months on a project that I hold dear – he has created biographies of all of the men whose portraits hang in the Chapel. These biographies will be printed in a book available in the Chapel for anyone who might want to know who these fellows were and why their portraits hang in this special place, the Pioneer Chapel. Born in Hanover, New Hampshire and raised in Thetford, Vermont, Edmund Otis Hovey graduated from Dartmouth College in 1828 and from Andover Seminary in 1831. He was ordained a Presbyterian minister on September 21 and married two weeks later. The newly-wedded couple immediately set forth on the arduous journey to Indiana, where Hovey established himself as the only Presbyterian minister in Fountain County, about twenty miles northwest of Crawfordsville. Hovey was among the group of Presbyterian ministers and laymen who met in James Thomson’s home in Crawfordsville on September 21, 1832, to consider the establishment of a new college. The minutes of that meeting are in Hovey’s hand. The next day he was elected as one of the eight original trustees of The Wabash Teachers’ Seminary and Manual Labor College (the name was changed to Wabash College in 1851). Hovey chose the College’s first professor and its first two presidents, and he was one of its major fundraisers. He was the first librarian and later served as college treasurer for twenty-six years. He was secretary of the faculty and of the executive committee of the board of trustees until his death in 1877. Although trained for the ministry, Hovey had been interested in science since his late teens. After some initial hesitation, he was persuaded to accept the professorship of chemistry and natural science, and in 1855 he became the first Rose Professor of Chemistry and Geology. He was a serious scientist, giving carefully prepared demonstration lectures in chemistry and amassing a “cabinet” of fossils, minerals and botanical specimens that ultimately contained over 26,000 items and enjoyed a national reputation as one of the most complete collections of its time. Edmund Otis Hovey died on March 10, 1877. He had lived to see his beloved college become a prosperous and well-regarded institution. Carroll Ragan [W1901] is a name still familiar to some on campus – which is just as it should be…Ragan, along with Ted Robinson, wrote “Dear Old Wabash”, our fight song. Ragan was the music man and Robinson gave us the words that all freshmen are supposed to know by Homecoming. There are those who could tell you that Ragan also wrote the Alma Mater. The picture above is from the Viewbook of 1898. 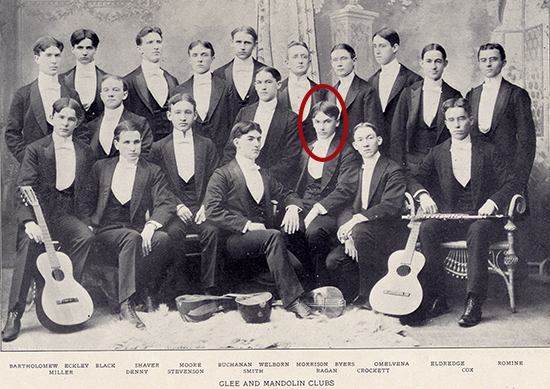 Ragan is on the front row, 3rd from the right, in this photograph of the Mandolin and Glee Club. Ragan left Wabash prior to finishing his degree which was a decision that he later regretted. But he always kept dear old Wabash close to his heart. From information in the historic New York Times, we learn that his musical career did not end with his stay at Wabash. When WWI came along Ragan composed the “Wabash War Song.” In the early 1920’s he was writing both words and music for musical comedies. An article from April of 1925 reported on the performance of the Wall Street Follies, an amateur theatrical troupe, of a piece called “Done in Oil.” Ragan wrote both the book and the music. The play was very well received before a hospital benefit crowd of 2,000 in the Waldorf Astoria Ballroom. Carroll Ragan was a creative young man – surely an advantage in his “day job” as an advertising executive. Following his employment in Illinois as the editor of a small town newspaper, Ragan headed to New York City. He secured a job as publicity man for the American Real Estate Corporation. In 1916 he moved to the United States Mortgage and Trust Company where he was publicity manager. A successful ad executive, Ragan often used his musical talents for the benefit of his clients. It is a wonderful thing to see the traditions passed from father to son, down through the decades. Creating generation after generation of loyal sons for Dear Old Wabash, as the song suggests and just as Carroll Ragan was in his time, is worthy work that continues yet today.